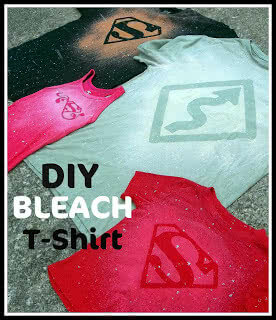 DIY Bleach T-shirt Tutorial – The Perfect Valentines Gift for Him or Her! Everyone loves T-shirts. They are comfy, they are easy, and it really doesn’t matter if you spill on them. My friend Leslie introduced me to designing your own t-shirt with a printed design and bleach. It was SO Easy and I loved how they turned out!1. First you need some sort of design… it could be anything! I decided to pick a “curves ahead” road sign because my husband loves riding fast on his motorcycle.2. You will need some freezer paper. Print out any design from your computer and trace it onto the paper side of the freezer paper. Then cut out your design. You could also use a Cricut to cut out your design. Make sure the shiny side of the paper is facing down.3. Iron your design onto your shirt, make sure the shiny side is facing down and the paper side is facing up. Lightly press the iron onto your design so it will stay. 4. Cut some cardboard(we used cereal boxes) and put it inside of your shirt so it doesn’t leak onto the back of the shirt. 4. BLEACH TIME! Fill your water bottle with 70% bleach 30% water. And spray away. Some shirts I sprayed really close to the shirt and others I stood back a bit. Spray as little or as much as you would like. I sprayed a little at first then went back and sprayed more. Certain colors (like black) will show up instantly. The pink and red shirts took close to 20 minutes. The longer they sit the more bleached out it will be. 5. When it is done bleaching, take your cardboard out, take your design off, and rinse thoroughly in the bath tub.6. Wash your shirt in the washing machine to make sure all the bleach is out and so it won’t bleach anything else. I've made these a few times, last summer we made about a dozen of them for our Relay For Life team. Please beware though, the bleach tends to break down the fabrics and holes develope quickly! Thank you for that tip! Do you think it was the amount of bleach used? If we use less do you think it would be better? I did this on a denim vest before I made it years ago. It worked great! What was left out here is immediately dipping your fabric in a strong vinegar solution, when it reaches the desired effect, to inactivate the bleach. This will definitely stop the problem with your fabric breaking down. I use approximately 50/50 bleach and water. I hope you have GREAT results!! I'd be careful mixing bleach with vinegar - it creates toxic chlorine gas. This is something for my "to do" list! Thank you for shareing! Oh my gosh you ladies are awesome! What a fun blog! I'm your newest follower and can't wait to read more!! amazing!!! i love it and can't wait to try it! I'm sorry, but what is "freezer paper"? I didn't know either until my husband started hunting! :) It has a plastic/waxy material on one side (so food won't stick to it in the freezer) and a paper material on the other. You can find it in any grocery store or walmart. It is usually by the saran wrap. Hope this helps! Can you use a vinyl decal or does it have to be the freezer paper? Yes! You absolutely can. I just did today. Make sure you press it onto the fabric really well. I put a Teflon sheet between the vinyl and my iron and gave a light ironing. What about the color? How do you get pink bleach or white or orange? The bleach will turn your colored shirts a different color. You don't always know what color it might turn out. Just have fun, but don't get your heart set on a certain color. Almost 10 years ago I was messing around with beach designs on shirts. I didn't think about ironing on freezer paper, instead my sister and I used big foam stamps. I don't remember if we brushed the bleach on them or just dipped but I remember it working. We'd end up having a beached out design where we placed the stamp. Not exactly a safe technique for kids, but as adults you could make them this way as gifts. This was so fun!! We did it down at my Mom's house with all of the grand-kids. They all designed their own designs with Mom's help and then we used Vinyl instead of freezer paper, because Mom has a vinyl cutter so we just used the scraps for the designs. It worked Great!! I had tried it with freezer paper earlier and they did not turned out so well(too much bleach, not enough, etc.). With the vinyl, everything looked really sharp and we didn't have any problems. And the kids liked revealing their design by pulling off their own stickers after the bleach was done. It was a lot of fun!! I am not having any luck with the freezer paper. No matter how much I iron it and how much/little I spray, it still leaks through the paper and my design doesn't come out. Has anyone had this same problem? HELP!!! Same here...I bought freezer paper especially for this project. I done 2 t shirts now and neither turned out very good...I might try vinyl or duct tape! This would also work with contact paper!!! :) Just trace your design onto it, and cut it out. Stick it on just like a sticker! Thank you For this comment. I also had problems with the bleed through and will try misting lightly and waiting. I had a lot of bleed through along the edges, enough that the design was not seen well. The little boy I was working with was rather disappointed that the Lego man was almost unrecognizable. Thankfully we were using an inexpensive shirt bought at the Dollar Store. Thank you for idea anyways, we plan to wash and dry the shirt, make another stencil and use fabric paint to paint the Lego man onto the bleached out area. We will still have a great shirt, it just may take some time to get it the way we want it. It might be helpful for future readers to edit the instructions steps above to mention this, I did not see this post until after our first attempt. My first try I used way to much bleach and it actually bled under the design. I now do two or three quick mists and walk away. About 1/2 hour later I return. if the design is not faded enough I'll spray again. This way you can limit the amount of bleach on the shirt. Perfect!! Thanks for the helpful suggestion! Would the iron on design from the freezer paper work for a tie-dye shirt as well? I tried this with clear packing tape to makes stripes, the bleach water bled under the tape. Sadness. My son does this every year at the local "Maker Faire". They use store bought letter stencils, and cut stencils from file folders instead of the freezer paper. Just be careful not to over-saturate the shirts with the bleach solution, so it doesn't bleed under the stencil. This is too cute. I have come to realize that I can immediately stop the bleaching process by soaking the fabric in vinegar water and then washing the fabric. Works like a charm; especially if the bleach falls on something it wasn't supposed to. I just had great success using freezer paper, and a pretty detailed design. No bleeding what so ever. I did pull it off fairly quickly and rinsed to stop the bleaching. My ratio was 2 parts bleach, one part water. I actually use freezer paper to paint stuff on shirts all the time. It's ironed down, so it stays put until I remove it. Ive heard that this leaves holes in shirt can someone tell me if it actually does!! Love this! I can't wait to do this for my kids. The "snow" looks great! I think I'll do a snow themed shirt for myself I love the snow!! Thank-You for sharing. I can't wait to see the idea / pictures the kids pick out for there shirts! Have done this twice now . one last Fathers day 2012 . My husbands shirt is still in great shape & he loves wearing it! and just now. Both turned out awesome!. I will say the bigger the design, the less intricate the better your results. Very Happy! Hey! I'm working on my gold project in girl scouts and I'd like to make/sell some of these for the fundraising part of my project, but I wanted to ask before I took your idea. Is that all right, is there anything I should include or may I just use the idea? Thanks! You are fine to use the idea. Thanks so much for asking. Hope you'll come back to Six Sisters' Stuff! Good luck with your gold project!! I tried this and had the opposite problem. The shirt wouldn't bleach! I sprayed and sprayed it, but the color stayed. Do you have to use a 100% cotton t-shirt? We used 100% cotton tee. I used the ducktape sheets...worked perfectly! I tried this and the freezer paper didn't work. it just curled up as soon as it got wet. But we learned something awesome! Once you spray the bleach, just quickly remove the pattern paper, and the bleach will continue do it's work! the only trick is to get enough bleach all around prior to removing the paper. We also then used heavy cardstock - and again, just removed it right after spraying. Works perfectly! It might also be called wax paper, or papel encerado (I used google translate). It is used a lot in the kitchen and also for crafts. It is kind of a see through paper but one side has a very thin layer of clear wax on it. Typically when you buy donuts, churros, or pastries, that is the paper that is used to handle it because they do not stick to it. Has anyone had trouble with the bleach running? I laid my shirt flat after ironing on the design. After spraying, the bleach pooled up on the wax paper. went underneath. Should I be leaving it to dry for a long while? What's not to really like. We've got stripes, coziness, and small variegated ombre action wrapped up in a tiny Hurley bow on this winter fashion have to-have. OMG! You guys rock! I can't wait to go shopping and then work on various designs. Thanks for sharing! Thank you! I just did this as a gift for a friend. I used the green frog painters tape and created my own design. I sprayed and washed in the bathtub. Turned out great!